Back in the 1890's, an American event promoter named Sol Bloom coined the term "belly dancing" for a dance form that is known as "Oriental dance" in the Middle East where it comes from. It's called Oryantal dans in Turkish and raqs sharqi in Arabic, both of which mean "dance of the East" or "Oriental dance". Traditionally, neither language used the word "belly" (or any other body part) to refer to it. In recent years, the Turkish people have started to refer to Oriental dance by the term göbek dansı (the translation into Turkish of the words "belly dance") because of the influence from foreigners. Click on any of the photos below to see it in more detail. All photos by Shira. 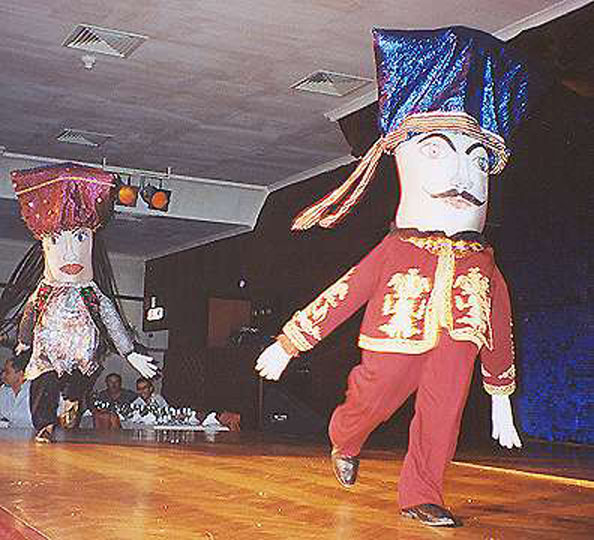 But there is a folk dance that the Turkish people call göbek dansı, and it doesn't look a thing like Oriental dance! Or, they might call it gobelin kuklasi dansı, which means "belly puppet dance" or asuk masuk. So when the Turkish people use the term "belly dance" in their own language, what kind of dance are they thinking of? It might be Oryantal dans, but then again, it might be something completely different. This article contains photos from a tourist show in Turkey performed on July 12, 2000 at a nightclub called Gar Gazinosu in Istanbul. 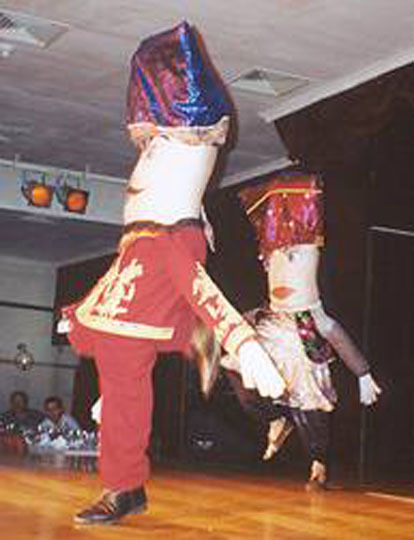 Göbek dansı is a duet, with one dancer dressed as a man, and the other as a woman. 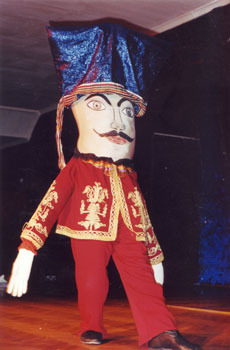 The accompanying music is a fast Turkish-style chiftetelli rhythm. 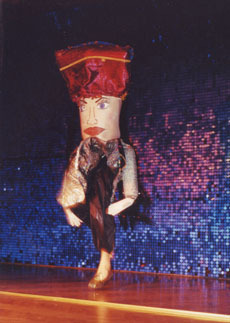 The dancers romp playfully around the stage, taking turns chasing each other. It comes from southern Turkey, from the Silifke region. The dance tells of a couple who love each other but have obstacles preventing them from getting together. Both dancers are portrayed by young men. The faces of the characters are painted on their abdomens. Alternatively, performers may paint the designs on a skin-colored T-shirt which can easily be put on and removed. This makes logistics easier to manage in a full show with several costume changes. The headdresses, which come to just below the dancers' armpits, hide the dancers' heads and arms. The arms reach above the head, with the hands clasping opposite elbows. Click on the photo to see more detail. 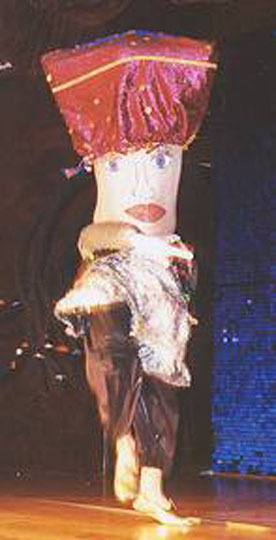 The "neck" of the character's costume rides below the dancers' hips, with the "arms" attached to it so that they flop about as the dancer frisks around the stage. It was difficult to snap good pictures, because the dancers were in constant motion as they danced about the stage to the lively music. At one point during the dance, the two characters wound up "face" to "face". The two dancers then performed energetic abdominal rolls, to portray the notion of the characters kissing. For the finale, the two dancers made their way to a stage-side table, and each selected an audience member to "kiss" by rolling their abdomens close up and personal next to audience members' faces. 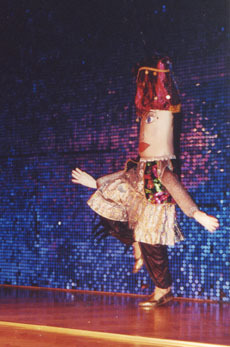 At the end of the show, as the two dancers prepared to make their exits, they removed their "headdresses" to reveal themselves. They then peeled off the tight-fitting flesh-colored shirts which had had the characters' faces painted on them, giving us a view of their muscular bare chests before they disappeared behind the curtain. These photo galleries show photos taken in Turkey in July, 2000. Oriental Dance at Gar Gazinosu. Photos of performances at Gar Gazinosu. Oriental Dance at Kervansaray. Photos of performances at Kervansaray.